On the quest for the country’s finest. 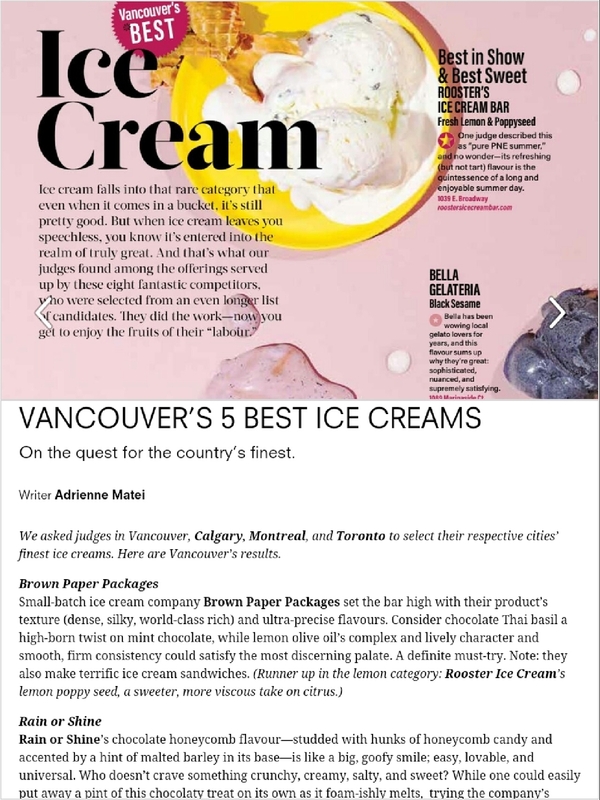 "We asked judges in Vancouver, Calgary, Montreal, and Toronto to select their respective cities’ finest ice creams. Here are Vancouver’s results. Small-batch ice cream company Brown Paper Packages set the bar high with their product’s texture (dense, silky, world-class rich) and ultra-precise flavours. Consider chocolate Thai basil a high-born twist on mint chocolate, while lemon olive oil’s complex and lively character and smooth, firm consistency could satisfy the most discerning palate. A definite must-try. Note: they also make terrific ice cream sandwiches. (Runner up in the lemon category: Rooster Ice Cream’s lemon poppy seed, a sweeter, more viscous take on citrus.)"